On Wednesday October 10th, 120 participants from all over Europe gathered at Oslo Airport Gardermoen for the INVADE Oslo 2018 conference. With a strong and very competent list of 18 speakers, the event was a flying success. The conference revolved around highly relevant topics regarding the smart business of batteries – trends and opportunities. “It is important to share information and learn from each other. This is quite a new market, with new technology and new ways of thinking, so I believe events like these are very important,” comments Trond Furenes from Smartly, which is sub-provider to INVADE partner, Lyse. The EU Horizon 2020 project, INVADE, aims to demonstrate how stationary batteries and “batteries on wheels” can be used to optimize energy and power related operations for the benefit of grid owners, private households and buildings, as well as the market. The INVADE Oslo 2018 conference consisted of a well-balanced program with 18 informative and engaging presentations, as well as sufficient time to mingle and meet new and interesting partners and companies. “I am here to learn exactly what is happening in the INVADE project, and how we are going to overcome the climate challenge and win the battle. I think this event is extremely beneficial for young researchers like myself,” says Victor Mukherjee from VTT, who stepped in for colleague Mikko Pihlatie and presented “Who wins the battery race?”. “There is a hope that Europe as a whole can win the battery race and achieve the goal to battle the global climate change. Europe can take a big part in that,” explains Mukherjee. Regulations – brake block or guidance for future energy solutions? Electric vehicles: Flexible resource or dreaded technology? Sarah Carter from Ricardo was also one of the event’s speakers. She was part of session 2 and talked about “Strategic flexibility services to network operator”. “I think power systems is a really exciting place to be at the moment, because so much is changing. This event is really good because it brings lots of different people together, so that they can all share ideas and learn from each other,” says Carter. 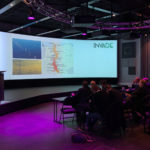 Her view is shared by Josef Noll from the University of Oslo, who attended the conference to learn more about the INVADE project and its impact, as well as experiencing the highlights of every presentation. “The whole topic of energy is going to change our environment. I basically work on security. For me, the impact on the security and the autonomy of the network is important,” says Noll. Jan van Meijl from VDL Enabling Transport Solutions held the presentation “I have never tried that before, so I think I should definitely be able to do that. E-mobility: the new normal”.